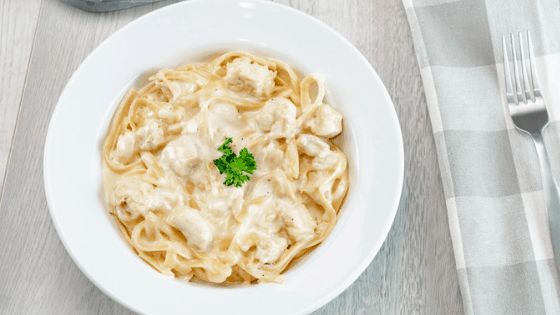 This creamy Chicken Fettuccine Alfredo is made in the Instant Pot and is ready in less than 30 minutes. This recipe is a “dump and go” and is all made in one pot. It is possible to get perfect noodles in the Instant Pot. My trick is to slightly undercook them if I still need to use the Saute after the pressure cooking is done. Since the noodles still cook during the Saute setting, this allows the noodles to soften up a bit more when adding more ingredients such as the heavy cream and Parmesan cheese. The end result by doing this is that the noodles aren’t too soft or mushy. Also, by breaking the noodles in half, they fully fit in the inner liner of the pot and can all be submerged. I have used shredded cheese when making my own soups and sauces. It works out okay but often times it’s stringy instead of creamy and smooth. I use blocks of cheese than I cut into chunks to melt into my food and the texture is much better than using shredded varieties. This creamy chicken alfredo is made with fettuccine noodles and made in less than 30 minutes. Set Instant Pot to SAUTE. Add in oil and cook chicken long enough to brown all sides. Scrape bottom of the pot to remove any bits that may be stuck. Add in butter and garlic cloves. Add in the broken in half fettuccine noodles in the pot. Spread the noodles around and don't clump them together. Add in 1 1/2 cups of chicken broth and add in the 1/2 tsp of salt. Press down gently on noodles if needed to submerge in the pot. Close the lid and set to MANUAL for 7 minutes. Allow to NATURAL RELEASE (NR) for 5 minutes before removing the lid. Stir the noodles together with the broth. They may be undercooked - it's okay. Set Instant Pot to SAUTE. Add in the Parmesan Cheese and stir to melt. Add in the heavy cream and allow about 3 minutes for the sauce and cheese to melt and thicken.